If you want the race Blog, ignore the first 5 paragraphs! It’s written for me to remember as much as it is for others to read. Sorry, but there are photos at the end! I haven’t written a Blog for a few years and thought it was about time, especially as I have taken part in the hardest race I have ever attempted. 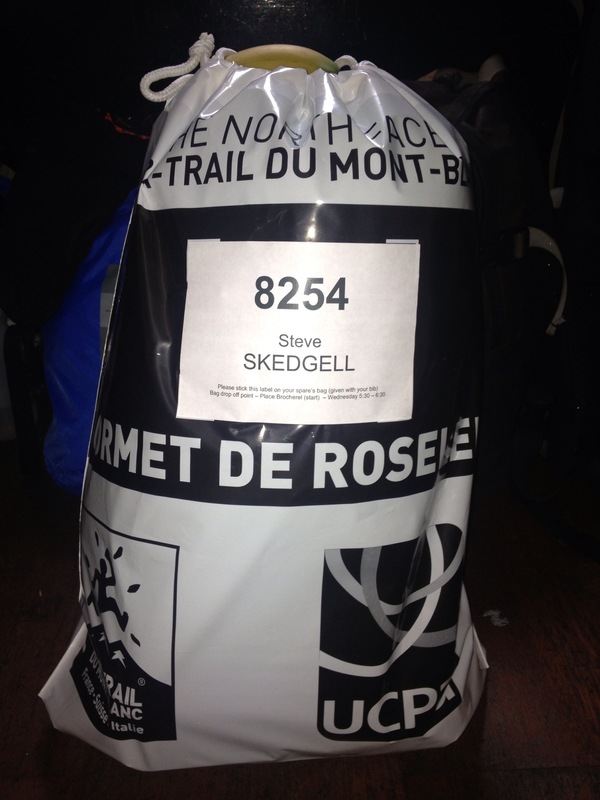 I completed the UTMB 2012 although expecting 160k and 9,600m of ascent, due to bad weather at altitude, this was reduced to 110km and 5,600m of ascent. For the record, last year, I came 661st of 1618 finishers (2,400 started) in a time of 22:58:16 and the second longest time on my feet. 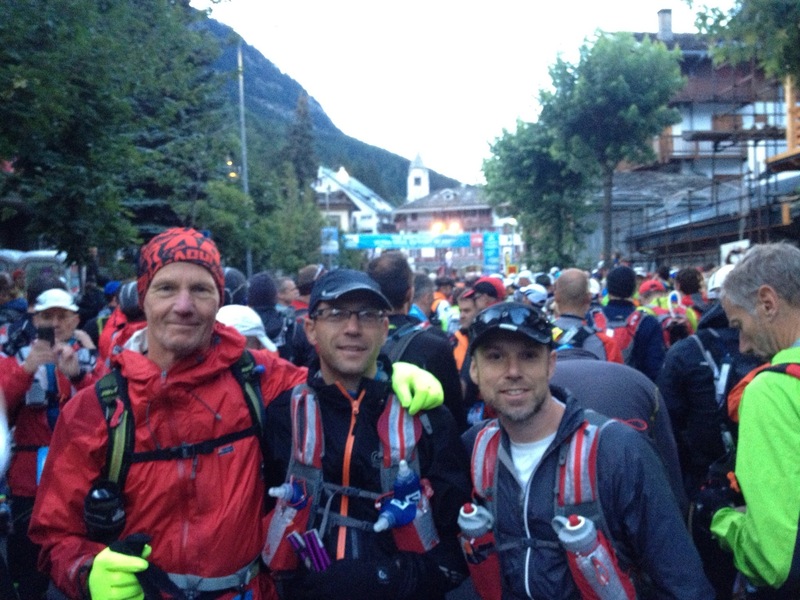 I Arrived in Chamonix with running mates Andy Miles (Centurion Grand Slammer 2012) and Ray Hasler (29:34 completed of Centurion Runnings’ North Down Way 100 miler, 17 days prior to this race!) 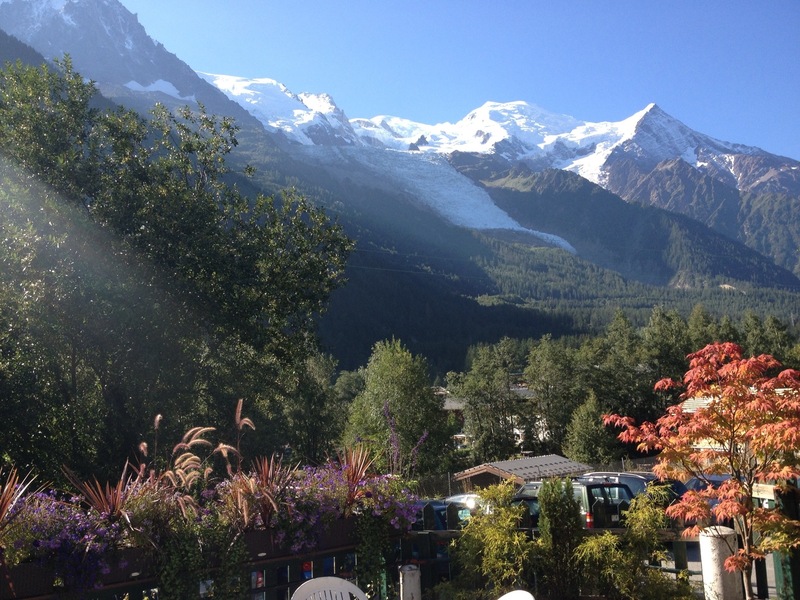 on Sunday and before long we had wandered the streets, had photos at the UTMB start line and TDS finish line, plus decided to go to my favourite bar that evening, Micro Brasserie de Chamonix. Ray is a raw vegan, so finding a suitable meal for him is always difficult, especially when the restaurant is renowned for its burgers. Anyway he munched on his salad while we devoured our burgers! 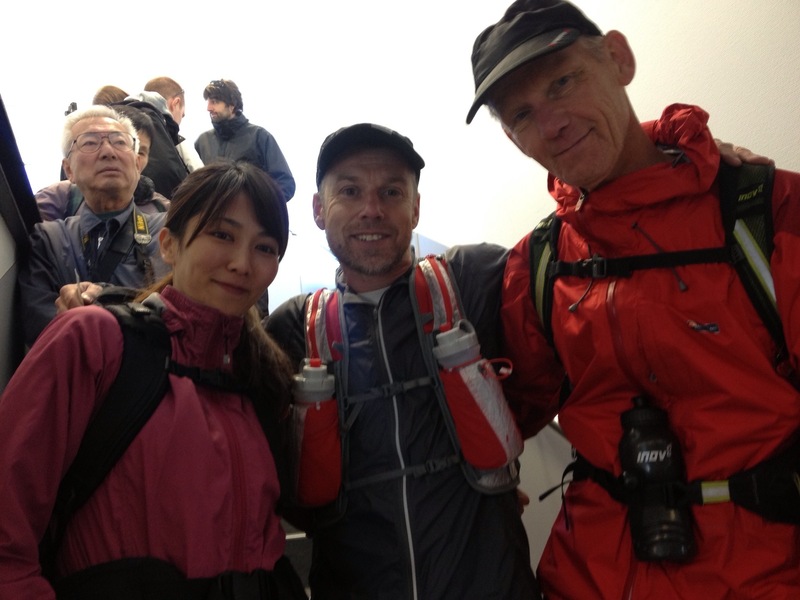 Monday we put our running kit on and joined a Japanese lady, Miki, who was staying in our hostel. We walked to the cable car station at 7am to then go up to 3,842 metres to the viewpoint Aiguille du Midi to see Mont Blanc and the surrounding area, way above the clouds and, of course, Chamonix in the valley below. A cable car down and we said our goodbyes to Miki, then it was a first run for Ray in a fortnight and the first use of poles for Andy. 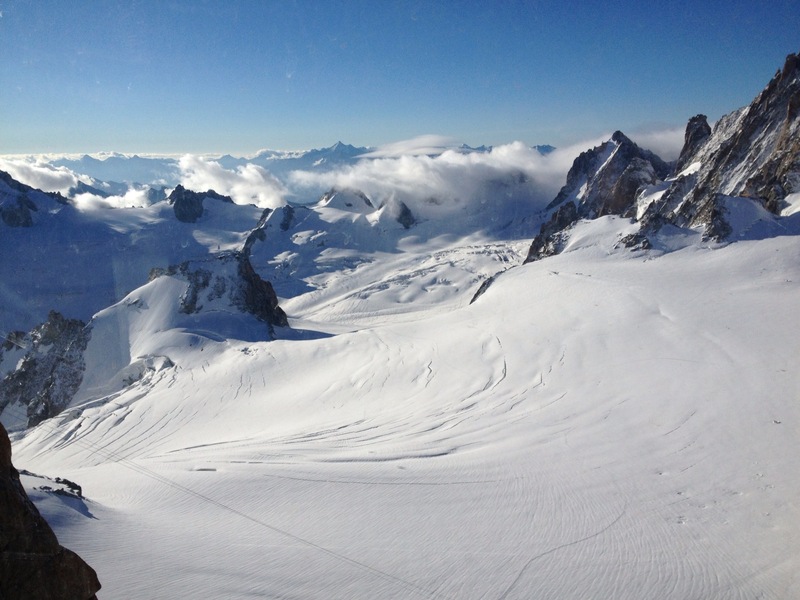 They were ‘blown away’ by the route along the Grand Balcony to Montenvers Mer de Glacé (a hotel, restaurant, viewpoint of a glacier and location for a train ride down to Chamonix). 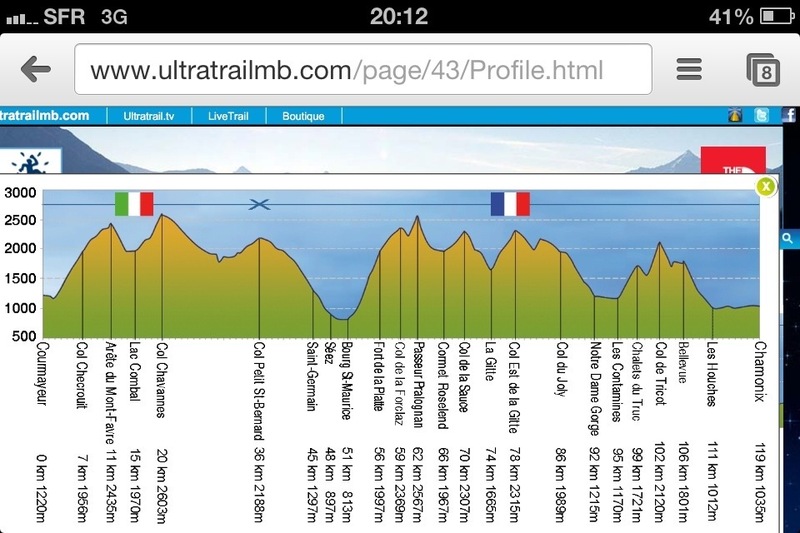 A technical route but not very hilly and one that I did last year, 2 days after completing the UTMB. 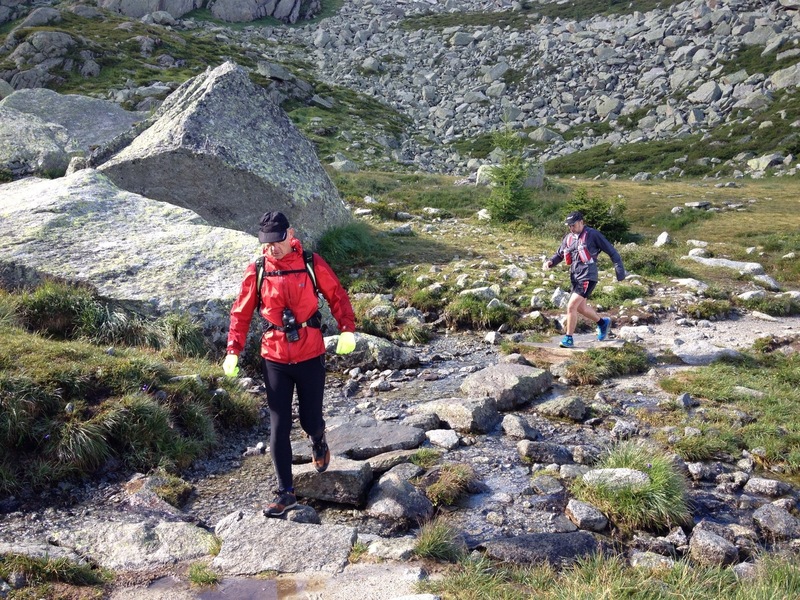 After a discussion about staying for lunch, it was decided to move on down towards Chamonix and this section was difficult to run fast, not that we wanted to, the guys had been saying how much concentration was needed to avoid falling, compared to what they are used to in England. It was 2/3rds of the way down when Andy needed to have an excuse for a coffee break and we found it in a beautiful Chalet beside the trail. Teas and coffees ordered and a beautiful French lady twisted our arm to have chocolate cake, she recommended we sprinkle sea salt over it. A superb and tasty idea and I will definitely be visiting there again, maybe next year. Whilst relaxing in the comfy chairs, a runner came down the trail who I recognised, I said ‘Hello, Joe isn’t it?’. 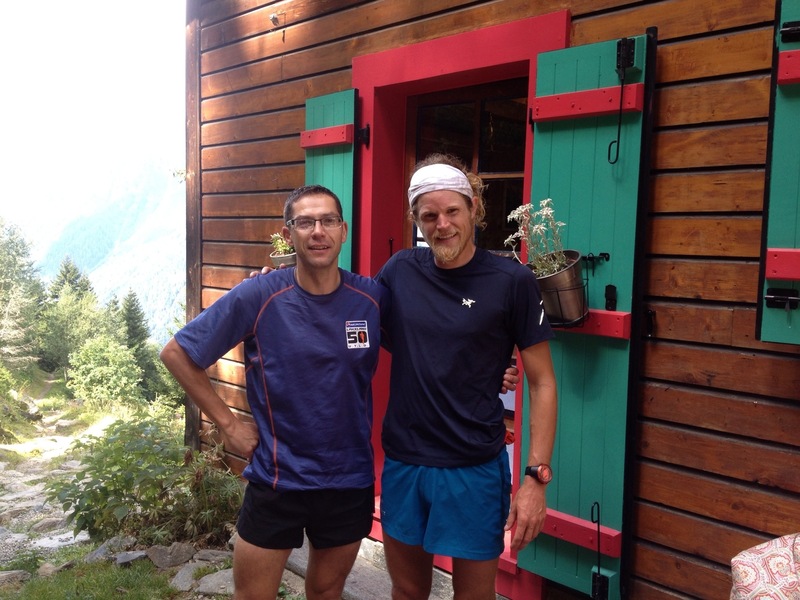 It was Joe Grant who was crewing for Anton Krupicka and who I wanted to win the UTMB this year. We had a chat and a photo and he went skipping on down the trail like a Springbok, because he’s a great runner and not because of our conversation! Tuesday was a day of relaxing after a fair few beers the previous evening, including watching Man Utd v Chelsea, and Registration that opened at 1pm. We were determined to get it all over early and joined a tiny queue half hour before and we were glad we did as there were a couple hundred people lined up when we left. The day before a race I like to eat a good lunch and dinner so I found a good priced Italian restaurant and had 3 courses. Later in the evening we went back to the Micro Brewery for another meal and I was the only one who dared have a couple of beers. 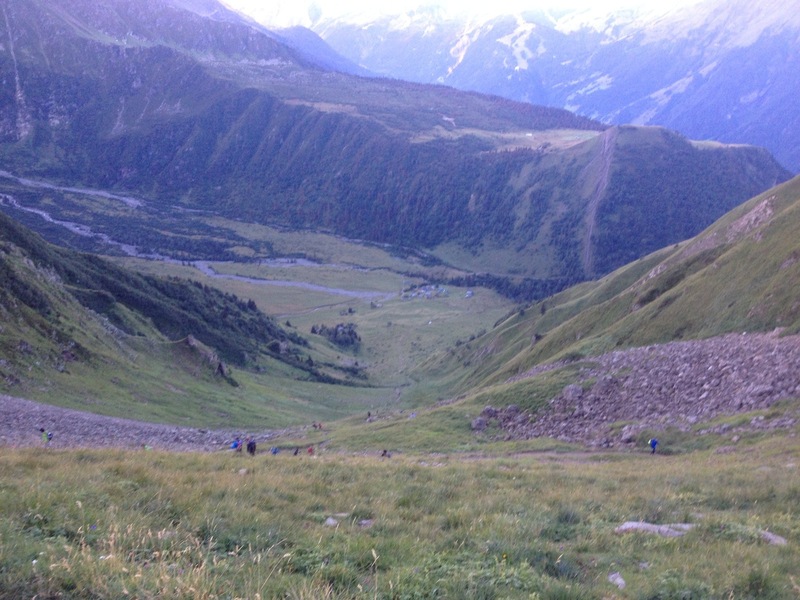 A relatively early night as the alarm was set for a 4am rise to catch the 5:15 bus to Courmayeur, Italy and the start of the race……….. The awkward thing about being bused to the start of a race, is breakfast. When should I eat, what food is available when we get there, etc. I took 4 bananas and a box of nuts, seeds and grapes for my breakfast which I suppose is different to many. I ate most of this on the coach and then kept a few bananas to avoid being hungry before the 7am start. My usual breakfast consists of a 3 egg omelette and that wasn’t going to happen today. We waited inside a sports venue for about an hour and just assumed this was the right place to wait. It was. 15 minutes before the start everyone started to walk into the town centre and this is where our drop bags were to be left and would be taken to Cormet de Roseland 66.6km (41.625m) Aid Station. Mine was full of a change of clothes, trainers, plenty of food, etc. 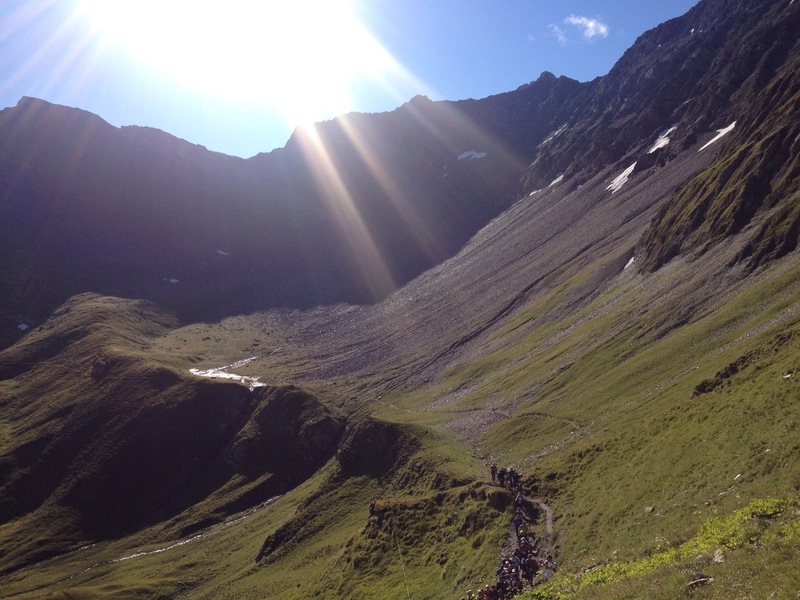 In addition to the UTMB kit list requirements of full body waterproofs, leggings, wind proof, long sleeved top, hat, whistle, survival blanket, emergency food, etc to be carried in our backpacks. It gives me peace of mind should anything be required and the weather is unpredictable in the mountains. It’s amazing that I put little actual thought about what the 75 miles and 7,250m ascent would be like, I felt I’d just see what happens. 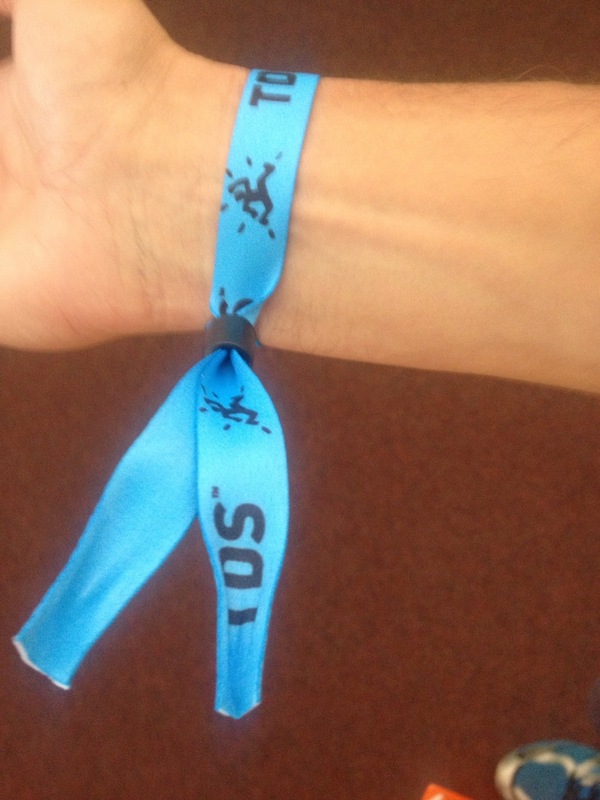 7am and the Start…. The race starts with a gentle run through the streets of Courmayeur and plenty of supporters. A downhill stretch which warmed us up so much that we took our jackets off and realised that we were near the back of the field! No so bad as I didn’t want to go too fast too early as there was so many miles to be completed and plenty of huge mountains to climb. We started the ascent, all using poles, and quickly Ray was left behind and we were wondering how he would manage having recently completed a 100 mile race with 26 minutes to spare, within the deadline. We kept moving up the mountain path likes ants to its nest and eventually arrived at the first aid station with no sign of Ray behind us. There was a blockage here with so many people and one tiny trail to get to. I grabbed some salami and cheese and started to move on. Whilst I wanted to eat from the aid stations I also did not want to lose too much time in case I needed it later, watching cutoff times. According to official figures gained after the race, I was 1403rd from 1525 starters. We had completed 736 metres ascent with a further 479 metres to the summit, an initial climb of 1,215 metres. For a comparison, the highest peak in England is Scafell Pike (978m), Wales is Snowdon (1,085m) and Scotland is Ben Nevis (1,344m). Somehow I had moved up to 1329th at this point, although I didn’t know this at the time. We hadn’t even done 7 miles and it took 2:38 to get there! We knew it was going to be a long day. Heading down to a checkpoint it was a case of follow the leader for a while but a few people were taking it very easy, Andy fell once and also twisted his ankle again but seemed ok. It was along this stretch that cowbells were heard and lots of them. The cows were straight-lining it across our switchback paths and didn’t seem to want to stop, causing confusion between runners. 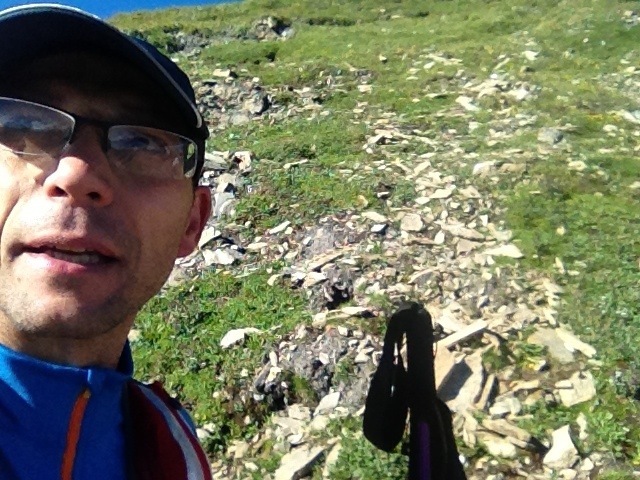 We made it down to a level path and still found it strange running on the flat to the checkpoint. It was noticeable that it was ‘dog eat dog’ at these aid stations as different nationalities, but mainly French, just barged in for water or food. When in Rome………and that’s how I dealt with it. What a surprise another ascent, 1,195m of climb. What we hadn’t thought about the time taken from aid stations to aid station, especially for food, as 16k to the next station doesn’t sound far and checkpoints do not always have water so I will be more careful in future. The next ascent was slow but about 75 minutes and then a beautiful sight of a long downhill path. I had been warned by Mark Brooks, an experience Ultra-Marathon runner that there were a couple of these ‘but don’t go too fast or you will hurt you quads’, which will be needed later. Took it fairly easy down but still I expected a water stop and it wasn’t forthcoming. I had to fill my water bottle in an ice cold stream in order to have enough before the next aid station. 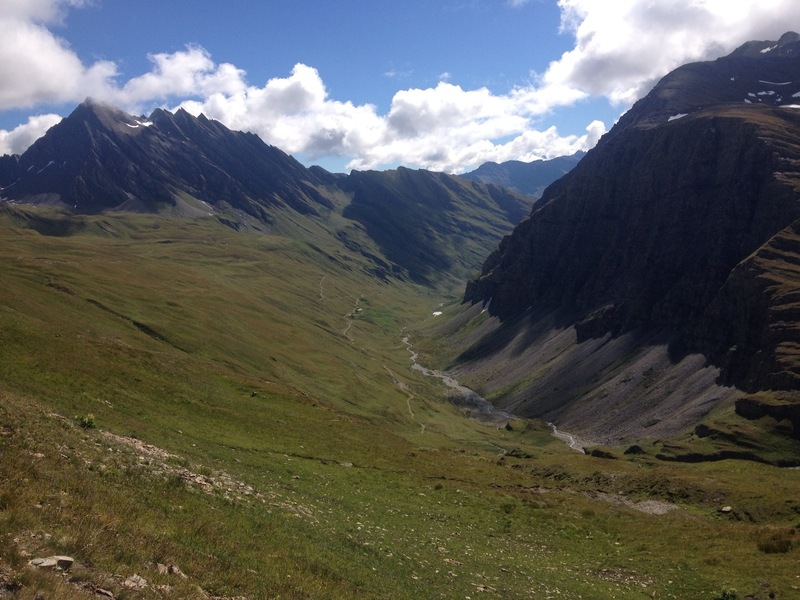 The 16k (10miles) took near 4 hours and at least the food was plentiful when we arrived at Col du Petit St Bernard. We had been there 10 minutes eating, salami, cheese, bread, noodle soup (always a must for salt replacement en route), bananas, raisins, biscuits, etc when Ray wanders in. A brilliant surprise as we had expected him to be quite a way back. It turns out he loved the downhill and caught is up. 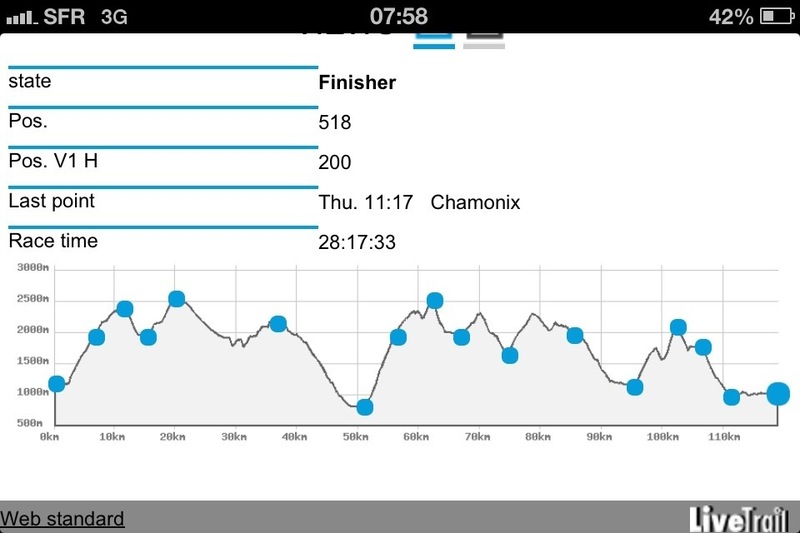 We all left the checkpoint together and set for another downhill to Bourg St Maurice of 15k (nearly 10 miles). I led, Ray followed and Andy somewhere near. Quite amazed how many people walked this stretch or long parts of it, somehow I moved up 70 more places to 1,073rd when I arrived. I grabbed coke and water to start with, then the usual noodle soup, Salami, Cheese and bread. I sat down to eat and Ray arrived saying how he’d been following me for a while and then got lost and would have been ahead of me. He should have followed me closer! With that, Andy’s shouting as he leaves the aid station! What’s going on? Brilliant though. He’s between me and the exit and its here that I realise there is a kit inspection before we are allowed to leave. I’m all for making sure everyone has everything stipulated on the kit list but it’s infuriating when you want to move on. The guy wanted to see both head torches, leggings, long sleeved top and waterproof. Of course, the 2nd head torch was buried at the bottom of my bag and then I spilled other items on the table and the floor. Anyway, onwards and UPWARDS. The next climb was 1,754 metres in 11km (6.875 miles) = Massive. It had turned into a hot day and as I left the checkpoint I had Mark Brooks calling me. He was amazed we were all together and that we were already well into the race (31 miles of 75miles in 9:35). The next 44 miles were going to be tougher and mostly through the night. Confidence boost that we were doing well and going up the ‘Leaderboard’ was just the job before the massive climb ahead. 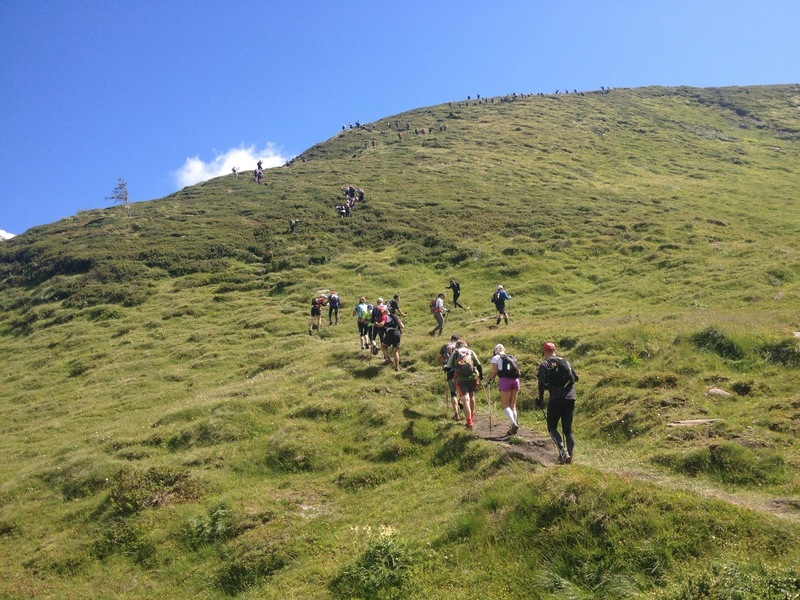 We started by running through a narrow street and within a minute onto a climb slowly and upwards towards Passeur Pralognan. I just kept following the feet of the person in front and before long Andy was sat in the hedge with a newly found friend. A quick chat and I was not in the mood to stay. It was sunny but I was desperate to finish this climb knowing there was a downhill and I hoped to be running it before dark. It was still a hot day but by continuing slowly but steadily was the best course of action for me. Stop start on these hills were not good for me. One foot in front the other, just watching the feet of the person in front. At this time I got talking to a Frenchman, however I cannot remember his name but he did mention a nice race he’d done but I cannot remember that either! Plodding on, he let me pass and after 1,200m climb we came to Fort de la Platte which I thought was a checkpoint but turns out to be an overgrown fort and there were plenty of people taking a rest and also other people coming down after withdrawing at the next checkpoint. No wonder I was climbing up the ‘leaderboard’! A further 372m climb took me to a checkpoint where I saw coke, fanta and other lovely drinks only to find that these we for sale my some local entrepreneur and our water was provided by a hosepipe! 2 hours 23 minutes of climbing and more to come! A slight incline saw me walking fast using poles and overtaking people only to be surprised by a technical downhill where hands were required to jump down safely. Another steep climb to the summit that took a total of 4 hours 2 minutes to conquer and according to later figures I gained 249 places. Astonishing. Up to 834th place. It was now 8:30pm and light was fading. Time to put waterproof jacket, warm hat and head torch on. There was a little fog but that was nothing to worry about because, as I went to run down the other side of the mountain, I was confronted with a steel bar attached to wall of rock. This was to enable a descent between jagged rocks that weaves down the mountain. There had either been rain or damp in the air and meant I had to be careful with my footing. I knew I was about an hour from my drop bag and copious amounts of food! This section was probably the worse of the course, maybe because I was hoping for a run down to the checkpoint or because it was plainly a nasty track that stopped any thought of running, especially in the dark. I arrived at the 66km (41.625miles). I took me 5 1/4 hours to do the 11 miles from the bottom of the valley to a welcoming food station. I had thought that was going to be the hardest part and I had already completed 4,500 metres ascent with ONLY 2,750 metres to go in the 33 miles left. I grabbed my bag that was full to the brim and delved inside and all I took was a Icebreaker Merino to replace the existing t-shirt, put on waterproof trousers (as these are cooler than leggings) and a few gels and Clif shot blocks. I would rather have a choice of clothes, food and trainers in case I needed them than not at all. Another great choice in the checkpoints were Overstims chocolate wafer biscuits, orange biscuits and some other that seemed to work for me. Noodle soup time, plus the usual. I sat down and focus on the task ahead and a further 8 hours of darkness. Probably spent 20 minutes there in total and had been on the go for 15 hours to this point. I do not remember much of the next section but it took me 5 1/2 hours and saw me arrive at Col Joly at 03:14 covering less than a half marathon! I was tiring and I’m convinced I was falling asleep on the previous climb and saw people lying on beds with blankets and wondered about a power nap, but thought these people needed the bed more than me (later I found out a guy in my hostel utilised a bed and then went on to overtake the people he had been with!). I made sure it was coffee with sugar and coke to increase the caffeine intake and help my concentration. I left this aid station in 669th position and alone. The next checkpoint was downhill, yes, downhill for 9k and 819m descent. The problem here is…….where there’s a down there’s an up! The trouble with this type of course is that it is technical and a down means be wary of slippery mud, tree roots in the wood, etc add the fact that it was dark, it meant slow progress. A mixture of walking and running was good, plus I spoke to a French guy called Laurent, who, I think, had problems with his camelbak earlier in the day and, unless lost in translation, he had an hour massage on his thighs in Bourg St Maurice, at 51k. He said he had been in the Top 200 in the morning and now he was at my level and walking to the finish. He did not finish last year and wanted to just arrive in Chamonix this year within the time limit of 33 hours. My goal was 29 hours which was midday Thursday. I arrived at Les Contamines aid station, which last year was extremely busy as it was used twice on the UTMB route, but it also meant extra noodle soup in quick succession! I needed to use the toilet on arrival and popped my head inside the doors but couldn’t find one. Eventually I realised you have to squat and poo in a hole! Bizarre and difficult having been on my feet for 23 hours! Leaving here was the start of the toughest part of the race. A long climb, a short down and a ridiculously steep climb. I started on up and quickly realised I was going really slowly and struggling to put one foot in front of the other. It was a steep start. I decided to sit down and have a energy gel with caffeine which included caffeine, I only had 3 energy gels throughout the race as the checkpoints were stocked with food I loved. This gel got my mental and physical motivation and I started up the 551m ascent. I started to catch people but the sun was rising and so was the temperature. Off came the layers and waterproof trousers and I was ready for the final push to the finish. I continued weaving through the woods to the top and then enjoyed the run/walk down. A wonderful view of a road got be excited as I thought there was a easy part, but NO, the steepest most stupendous hill was in front of me. A 401m climb, considering 6,380m achieved, might not seem much but there was tight switchback after switchback where plenty of breathers were required. I tried not to stop as it seems its the best way for me to climb. I was warned of a hard climb near the finish but didn’t expect it so steep. It had taken me 2 hours 27 minutes to complete 7km (4.375 miles) but I had overtaken people on the climb and moved to 578th! Now there was 289m ascent left (peanuts) and some runnable sections ahead (I had done the last 14km of this route on last years re-routed UTMB course, so confidence was high). The down from here was not easy, I started to run but needed use of poles as the mud was a little slippery and had many rocks which always seems right in the way of my foot placement. A few hand rails had to be used for more technical areas avoid falling down a drop and eventually arrived at Bellevue some 3 1/2 hours after leaving the last aid station. I removed my water bottle from my backpack only to find there were no food or drinks, just a guy scanning me at the checkpoint. 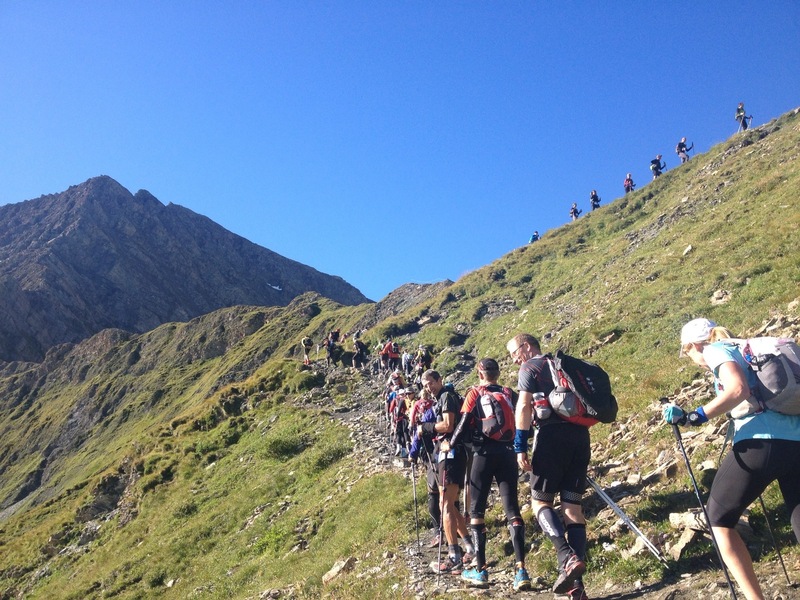 I knew from last year that the next section was downhill with woods and then a road to a plentiful aid station called Les Houches. It was a foot deep in mud last year so I was pleased to be able to run this section all the way. I was told that the final section was flat by a few people around me but after 70 miles any hill will take its toll. I quickly gulped some coke and had a coffee with added cold water. Gulped that down with 2 pieces of cherry fruit cake and refilled a water bottle. I did not hang around as I thought I might be able to finish before 11am and overtake plenty of others en route! Up to 546th position. 7.9km (5miles) to go to the finish. I walked this last year but was determined to run and reel in as many people as possible, however I did not bargain for a few hills that I just could not manage and soon realised that 11am wasn’t going to happen. Power walking was the name of the game and I was getting plenty of looks from those I overtook on the way. Astonishment that I had the energy to continue on. It did seem to take a long time to complete these few miles but I was getting more and more cheers as I neared the outskirts of Chamonix. I had saved my iPhone battery during the race in order to make a call to my Swedish friend, Daniel who had the only key to our room, and say that I was the first of 3 of us and I was nearly there. As I passed the Welcome to Chamonix sign, I overtook 3 guys and I thought I’d better keep running the incline as I was certain they wanted to re-take their positions. I dug in as I was aware of 3 further place gains and found it harder now I was hitting tarmac. I had a sneaky peak over my shoulder to see no one in sight and at this point I was yards from my hostel and only 500 metres from the finish. With a police assisted road crossing I was into the Main Street of Chamonix and this is where the atmosphere was sensational. Clapping, cheering my name (Steve is printed on my running number) and High 5’s too. It felt so amazing as I had been out on my own for hours and hours and so glad to finish within my goal and see the welcoming face of Daniel. 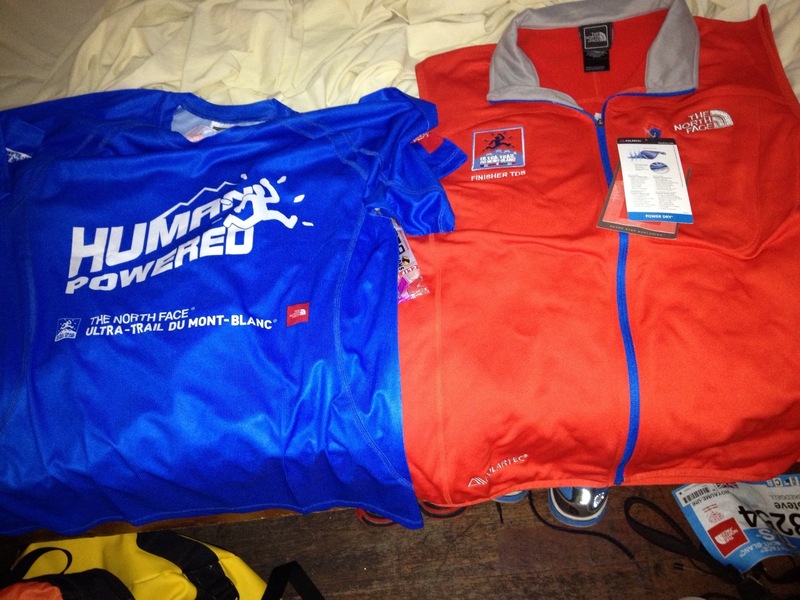 The race is sponsored by The North Face and instead of a medal, you get a TDS Finisher Gilet, this year in red. Not my favourite colour but within hours I was wearing it with pride around the streets of Chamonix and at finish line clapping in others. My final time was 28:17:33 and 518th position of 1525 starters. I had hoped to be in the Top 1,000 so I was delighted with my result. 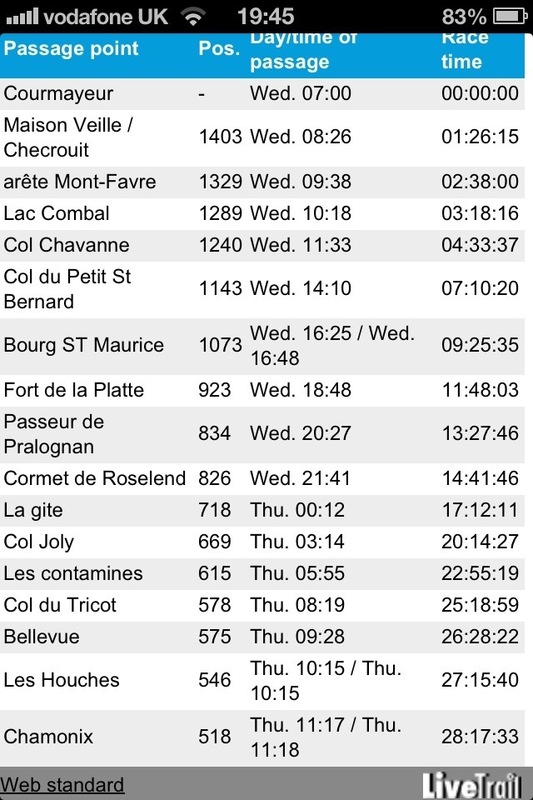 I progressed up the ‘leaderboard’ at every checkpoint and I am proud to have completed what many say is tougher than the UTMB. or the shorter race CCC. 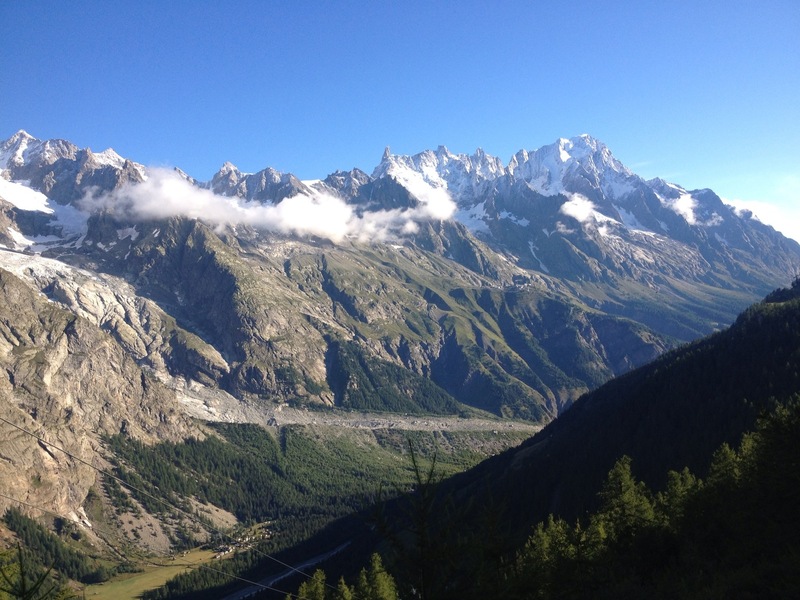 Chamonix is the ultimate in Ultra-running ‘Festival’, gathering 5,000+ runners together in such as scenic location is simply The Best and I hope I get to go again next year and see familiar faces once again.